Got these espadrilles for $4.99 at the Brooks Brothers Outlet store in Hershey, PA a couple of weeks back. While they are super comfy and cushioned inside, I don't think they really are made for walking, unless its on the beach or the boardwalk. City streets are very unforgiving, I actually have to bring my winter boots and my Lanvin flats for repair to the Leather Spa on 55th. Soon soon when I'm not too lazy to lug around 3 pairs of shoes, ugh! So for now, while I love these espadrilles, I only wear them around the house, heehee! Now about pair #2: Yesterday, my friend Xsa visited from PA, and we went out to run errands. I was wearing my French Sole flats and while I love them, when we stopped by Whole Foods we saw the Toms shoe section and I just had the urge to try a pair on. They were so comfy and light! I love how it has a leather lining inside so even if the uppers are made of fabric, it feels a little bit luxurious when worn. Oh, and since Xsa and I bought a pair each, we feel good knowing that there are two kids in need of shoes who will get a pair of Toms as well! 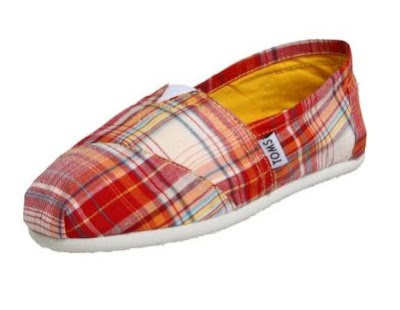 I'm crushing on Toms! Wish I could find them easily in Europe, though asking friends in the U.S. to dash to a Whole Foods for me is an option. Yours is a pretty pair! PS. Just discovered French Sole. My goodness, they are too lovely.